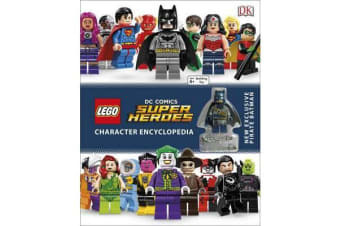 The ultimate guide to the minifigures of the LEGO DC ComicsO universe LEGO DC Super Heroes Character Encyclopedia is a comprehensive visual guide to the full range of LEGO DC ComicsO Super Heroes minifigures, including LEGO Batman, LEGO Superman and their friends and foes. Featuring facts and figures about all the characters from the LEGO DC Comics Super Heroes universe – including Green Lantern, The Joker and Wonder Woman – LEGO DC Super Heroes Character Encyclopedia details the sets where each minifigure appears, as well as their special weapons, cool gadgets and amazing vehicles. Plus, it includes a new and exclusive LEGO DC Comics Super Heroes minifigure.